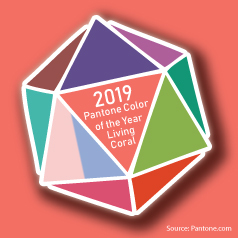 20 Years of Pantone’s Color of the Year: A Free RGB Guide How did I find each of the Pantone Color of the Year’s complementary and triadic colors? Pantone provides the RGB numbers. I took those numbers and subtracted each one from 255 to come up with the opposite color in the RGB spectrum. For color triads, I added or subtracted 85 to each RGB number to end up with three evenly distributed numbers in the RGB range of 1-255. I then took those RGB numbers and input them into Pantone’s color search tool. The color conversion tool then selects the closest Pantone color to those RGB numbers. Some of these combinations were a surprise, especially the triadic ones because they seem to be analogous in some cases. Here's the link to download a split two page layout for printing on standard letter size paper. Didn't Get a New 2019 Wall Calendar for Christmas? Didn't Get a 2019 Calendar for Christmas This Year? If you didn't get a wall calendar for Christmas, here are a few you can buy online. Like socks and pajamas, calendars are usually a sure bet for receiving as gifts on Christmas. I start this list with the essential King of Kitcsh, Elvis!